Last Monday was the first real cold winter morning in Birmingham with a light frost on the floor and cars needing to be de-iced. As well as temperatures dropping this time of year and it feeling cold, it’s when vehicles seem to get ever so messy, whether your own car or a works vehicle. They start getting cluttered, covered with dirt, and always needing to be cleared of ice for visibility on a cold morning. 1. Keep your outside glass clean and clear. So if it’s cold with ice, use de-icer and scrape off, or if you do the hot-water-from-a-kettle trick then make sure its below actual boiling point to reduce the risk of the glass cracking. Keep your washers toped up with water and solution to stop freezing, and ideally keep a spare bottle of water in the car in case needed to wash areas like your front windscreen which picks up more grit and mess this time of year. 2. Also keep the inside glass clear. Ok it’s the same material, but a different cleaning taks. Use a simple cloth or pad you can sometimes buy to keep it clear from smears, particularly if you end up using your hand or something to wipe any condensation off. 3. Outside lights. Make sure your front and rear lights are wiped cleaned and not covered with dirt as it can hinder light coming from them to warn others and help you see – which includes front/rear ones, side indicators, head and fog lights. Don’t worry about the car looking strange with just lights wiped and the rest messy, and also do the number plates. 4. Keep mirrors clear. Both the outside ones on each front door, but also the middle mirror inside. 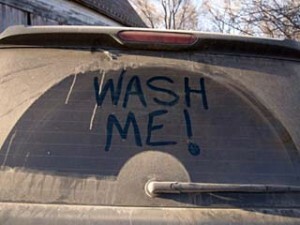 Watch out for condensation smearing them, or dirt clogging them, even after you’ve say de-iced it. Also look at those extra blind-spot mirrors to add on, personally a must on every car as they can easily help you spot cars all around you when driving. 5. Make sure foot wells are de-cluttered. With darker nights, busy lives, and lots of extra clothing and shoes, the foot wells can easily become cluttered with items and rubbish that is maybe not seen until say a weekend and the day light. Things can fester away though, start smelling not very nice, and even be or cause damage by people trampling on them and even jamming under your brakes as with the drivers footwall in an emergency, so make sure these are regularly cleared out. Contact Easy Cleaners for any help with clenaing cars this time of year.